the color experts at Zoya went back to the lab and created six more beautiful, long-wearing textured, matte and sparkling Zoya PixieDust Colors! This incredible and best-selling formula is sure to captivate with a magical sparkle and sugary finish like no other. ZP683 - Solange: EXCLUSIVE PIGMENT!!! Gold Metal sparkle, exclusive Zoya PixieDust Matte Sparkle formula. ZP677 - Beatrix: Tangerine Metal sparkle, exclusive Zoya PixieDust Matte Sparkle formula. ZP676 - Destiny: Coral Metal sparkle, exclusive Zoya PixieDust Matte Sparkle formula. ZP682 - Miranda: Rose sparkle, exclusive Zoya PixieDust Matte Sparkle formula. ZP675 - Stevie: Violet sparkle, exclusive Zoya PixieDust Matte Sparkle formula. ZP681 - Liberty: Blue sparkle, exclusive Zoya PixieDust Matte Sparkle formula. 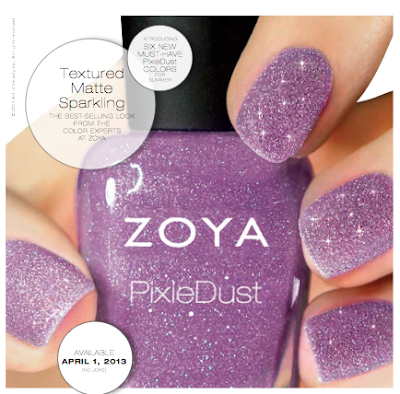 PixieDust Application: For BEST RESULTS apply 1-3 (for full coverage) thin coats of polish. Allow product to dry completely for full effect. Do not use a base coat or top coat. So what do you all think? Are you ready for some summery Pixie Dust?